If you have access to your iPhone, here are some quick ways to obtain your iPhone serial number, International Mobile Equipment Identity (IMEI), ICCID, or Mobile Equipment Identfier (MEID). 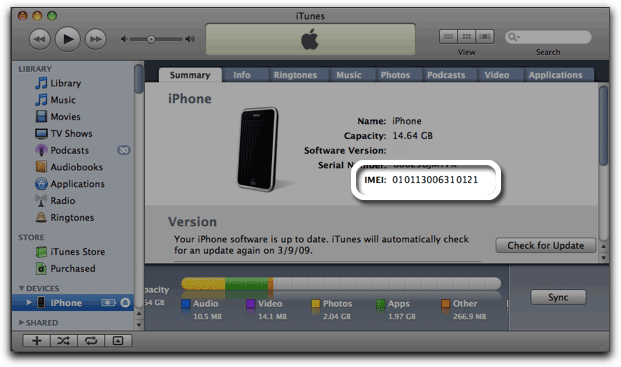 You can find your iPhone serial number, IMEI, ICCID, or MEID in the About screen on your iPhone. From the Home screen, tap Settings > General > About and scroll down. If you are unable to access the About screen on your iPhone, please use one of the following options to access the Serial Number and IMEI on iPhone models with SIM cards. If you have an iPhone 4 with Verizon, and are not able to access the information using the About screen, please see the section below to get the information from your computer. Please see this article for information on how to remove and re-insert the SIM tray. Once you have removed the SIM tray, the Serial Number and IMEI will be printed on the SIM tray as shown below. 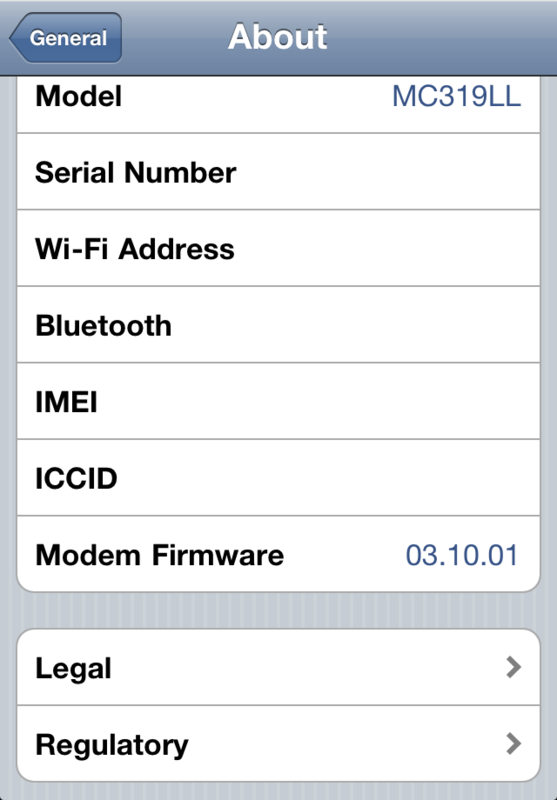 The SIM tray on an iPhone 4S activated on CDMA carrier displays both the MEID and IMEI number as 15 digits. 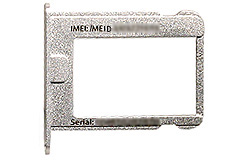 The MEID number uses the first 14 digits, disregarding the last digit, and the IMEI number uses all 15 digits. If you have access to your computer and prefer to get the information using it, or if you are unable to use the iPhone itself, the following includes ways of accessing your iPhone serial number, International Mobile Equipment Identity (IMEI), ICCID, or Mobile Equipment Identfier (MEID). 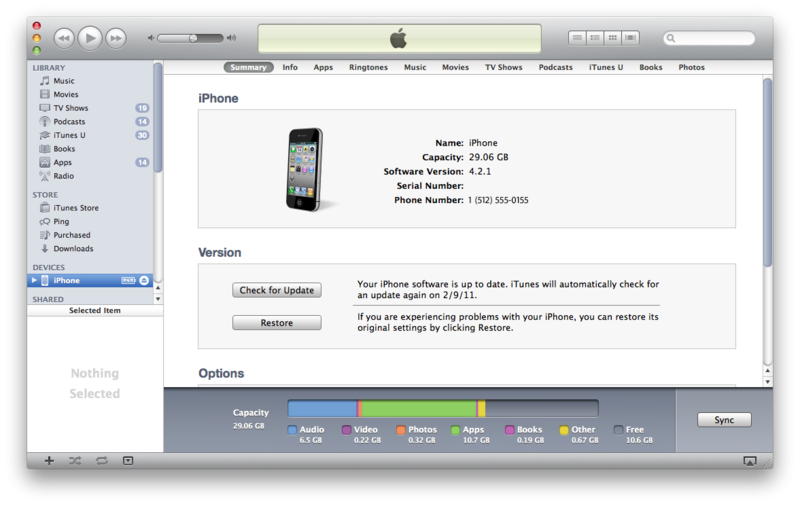 Select the iPhone when it appears in the left-hand column. Some GSM carriers may not store the phone number on the SIM card, so the data may not be available in iTunes. If that is the case, you will want to access the information using one of the aforementioned ways. See HT2232 for more information. You can choose Edit > Copy to put the serial number on the Clipboard. You can then paste the serial number into an email or webpage (for service or registration for example). 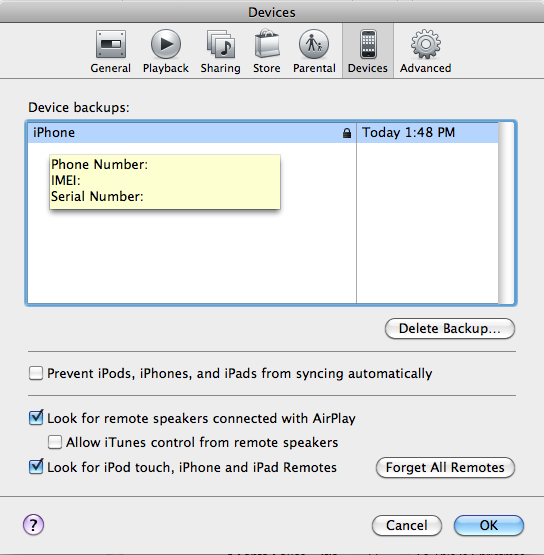 Position the mouse over a backup to display the phone number, serial number, and IMEI or MEID of the backed-up iPhone. Hold down the Option key (Shift key in Windows) to reverse the scrolling. Press the Space bar to pause the scrolling. In Mac OS X, choose Edit > Copy (or Command-C). If you still have the device's original packaging, you can find your iPhone serial number and IMEI or MEID printed on the barcode label that's affixed to the packaging.